Image caption Venezuelan state TV celebrated Gen Carvajal's release as a "triumph of Venezuelan diplomacy"
Venezuelan President Nicolas Maduro has welcomed the release of Gen Hugo Carvajal, who had been detained on the Dutch Caribbean island of Aruba. Mr Maduro praised the Dutch government for freeing Gen Carvajal, whom the US accuses of links with drug trafficking. The president hugged and joked with Gen Carvajal at a socialist party congress in Caracas. The general, an ex-chief of military intelligence, had been appointed by Venezuela as its consul to Aruba. 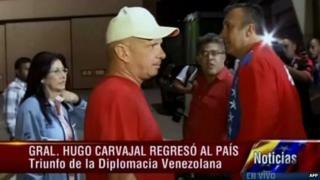 Gen Carvajal, who was a close ally of the late Venezuelan president, Hugo Chavez, was arrested in Aruba on Wednesday. US authorities allege that in his role as military intelligence chief, Gen Carvajal protected drug shipments made by Colombian traffickers through Venezuela. He has also been on a US Treasury blacklist since 2008 for alleged links to left-wing Colombian rebels. Venezuela had appointed Gen Carvajal as consul to Aruba, but the Dutch government has so far rejected the appointment. Following his detention, a judge in Aruba argued that Gen Carvajal did not have diplomatic immunity from arrest because he had not been accredited as a diplomat by the Dutch authorities. But on Sunday, Aruba's justice minister Arthur Dowers said Gen Carvajal would be freed because the Dutch Foreign Minister had decided the Venezuelan official did have diplomatic immunity after all. However, he was declared persona non grata and told he would be arrested if he returned. The US said it was "deeply disappointed" by his release. "We made a legitimate request for Carvajal's arrest in conformity with our treaty which governs extraditions between the United States, the Netherlands, and Aruba," a state department spokesperson said. In a statement, the spokesperson also said that the US had "credible reports" indicating that the Venezuelan government had threatened the governments of Aruba, the Netherlands, and others to obtain Gen Carvajal's release. President Maduro said the Dutch authorities had "resisted pressure" to keep Gen Carvajal locked up and praised them for their "brave decision". Gen Carvajal was met at the airport by Foreign Minister Elias Jaua and First Lady Cilia Flores. He later appeared on stage next to President Maduro at a congress of the governing United Socialist Party in Caracas. Image caption President Maduro called the arrest of Gen carvajal a "kidnapping"
Mr Maduro said Gen Carvajal was "the man who had inflicted the biggest blows against drug trafficking, 75 drug barons [arrested], a world record". Gen Carvajal accused the judge and the prosecutors of being corrupt. "I suspect they received money to do what they did with me," he said.